Turkish cuisine is a refreshing mixture of Greek, Middle Eastern, Mediterranean and Central Asian flavors. Exactly what and where to eat in Istanbul is going to be an important part of your trip to this city. When visiting Istanbul, it’s likely your hotel will be situated in Sultanahmet somewhere near the Blue Mosque, Topkapi Palace or Hagia Sophia. Don’t expect to eat real Turkish cuisine here. 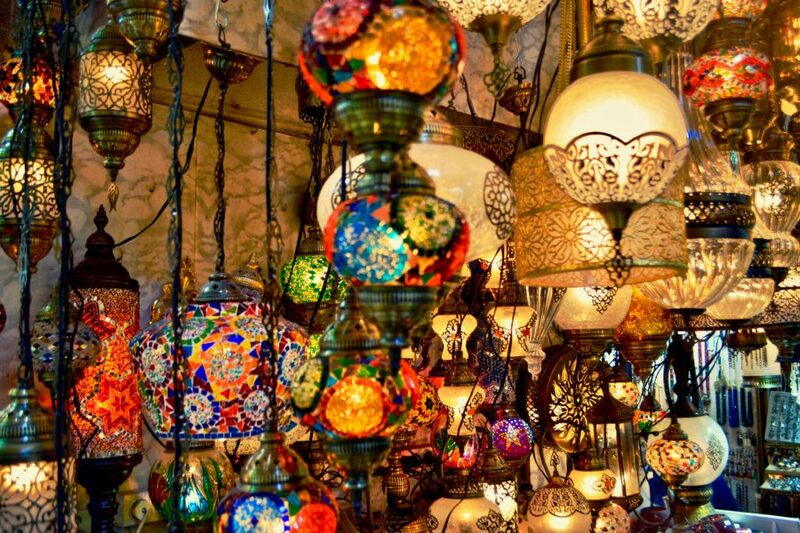 Sultanahmet is convenient but it is also the most touristy…. which inadvertantly means the busiest streets will house the most inauthentic and expensive food around. I had been warned about this prior to going but felt lazy to venture out for dinner on my first evening there. Half a block down from my hotel, a popular with the tourists establishment served me Turkish pastry filled with mozzarella cheese and soy sauce as the dipping condiment while Pour Some Sugar On Me played in the background. I laughed but realize that it wasn’t funny. So do yourself a favor and take an extra few minutes by foot or tram and you’ll be tasting the delights of real Turkish cuisine. There’s so much to mention but the main staples that are must try’s on your first trip are listed below along with places to sample them. Do a Turkish Breakfast on the coast of the Bosphorus. There are tons of places to choose from here, frequented by locals as well, allowing for restaurants to compete and serve you their best. Breakfast is an affair, not to be rushed, consisting of cheeses, vegetables, olives, eggs, baked pastries and meats. Worth noting are sucuklu yumurta and börek. Sucuk is dried sausage made of ground beef with garlic and a variety of spices and cooked in a pan with eggs. Its fattening but delicious. Known as Turkish ravioli, mantı is a hot dish served with cold yogurt and garlic. Manti is a kind of dumpling consisting of dough and its filling. The dough is made of water, flour, salt and sometimes eggs. The filling contains grounded beef or lamb, onion, salt and pepper. Manti can be ordered with salmon, spinach, or even chicken in many places now. Its pretty delicious and I had by first bowl at Klemuri, a traditional Black Sea cuisine restaurant located in an old building on a side street in Beyoglu. İskender Kebap is döner meat. 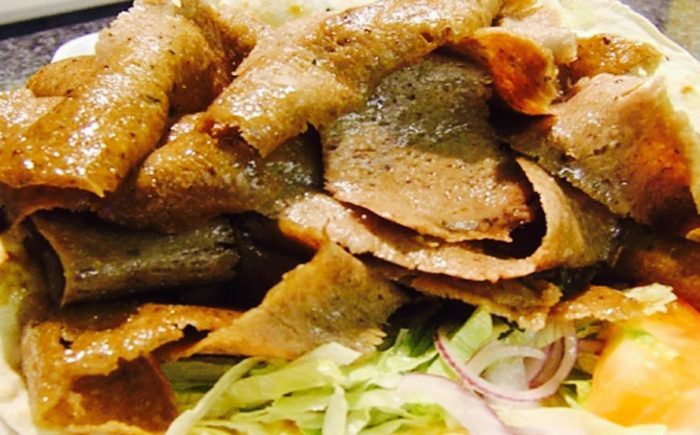 Döner is a dish of pieces of meat seasoned with herbs and spices and skewered on a spit and then grilled vertically. I rarely touch red meat these days but this is worth the exception. Its usually served with pide, a pita like bread, and dressed with butter and tomato sauce. Yogurt is added to the side. I’ve tried doner meat in many places but there is nothing quite like the doner served in Turkey, its home. Chicken varieties are also available but the meat one is heavenly. There are many street side shops and casual places in Istanbul that serve good doner meat. Şehzade Erzurum Cağ Kebabı – not too far from the touristy area, this restaurant has some of the best kebabs in town. Ciya – makes the list of top Istanbul eateries repeatedly. Located on the Asian side in the Kadikoy neighborhood on the pedestrian walk. A must if you are a meat aficionado. 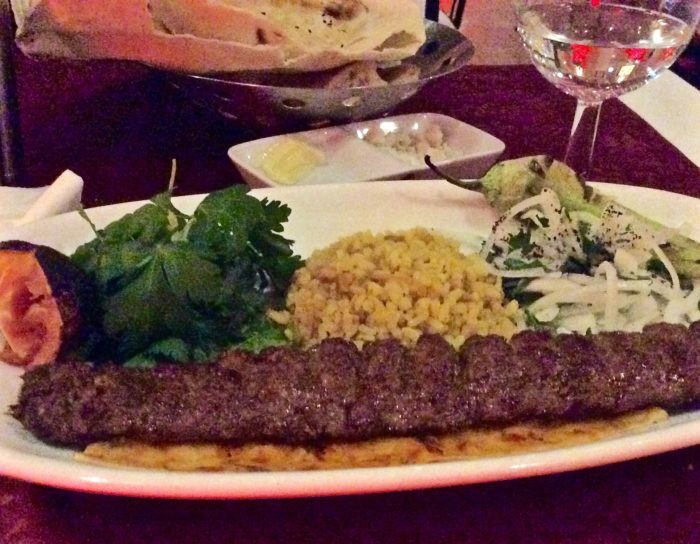 Adana kebap has “Controlled Designation of Origin” since 2009. An original Adana kebap can only be made by establishments who are inspected and approved by the Adana Chamber of Commerce. Preparation is apparently very specific and essential ingredients consist of lamb meat and the tail fat. The male animal has to be grown and fed locally. Meze are cold starters, think tapas. I love this style of eating, you get to sample a bit of everything. Restaurants that specialize in mezes are called meyhane. A meyhane is a traditional restaurant which serves mezes and traditional foods with alcohol. Usually the waiter will come to your table with all the meze for you to choose from. Toasted bread is served on the side. You can eat Borek any time of the day and trust me, I did. 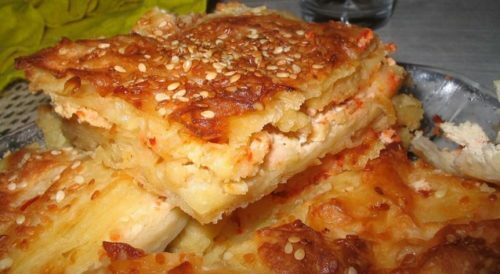 Börek is made of thin sheets of dough, filled with cheese, minced meat and/or vegetables, baked or cooked. The Most popular ones are ıspanaklı borek (with spinach filling), peynirli borek (with cheese filling), kıymalı borek (with minced meat filling) and patatesli borek (with potato filling). Künefe is a traditional Arab cheese pastry. The unsalted cheese in between the two layers of dough, kadayıf, is sumptuous. It is soaked in syrup, served warm and sprinkled with ground pistachio. The melted cheese balances the sweet of the syrup. Try the Jordanian version of this in smaller form which is fried. Both are unexpectedly good. 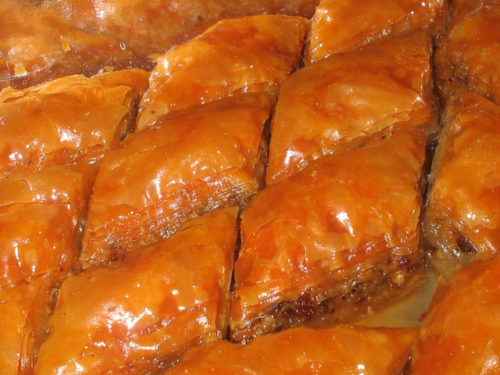 Baklava is the truest example of Turkish dessert. I haven’t tasted Baklava as delicate as this anywhere, not even in Greece. The ingredients consist of phyllo dough, nuts and syrup. Sound simple? Not really, the technique can be complex due to the thinness and layering of the phyllo dough. The nuts used differ from region to region in Turkey. 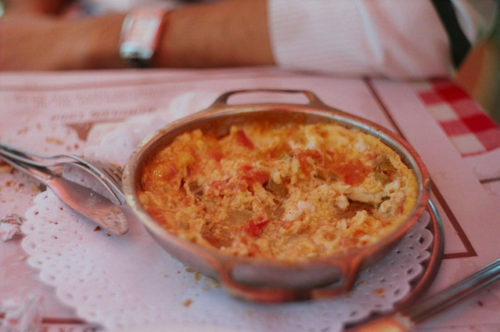 Menemen is a Turkish style omelet. Roasted onions and peppers are cooked with tomatoes and mixed with eggs, herbs, parsley, pepper and grounded red pepper. Its mostly eaten with breakfast but deserved a separate distinction here. It has several versions with extra ingredients such as mushrooms, eggplant, cheese, grounded meat and sausages.. So, these are some of the highlights of Turkish cuisine I think are worth a mention. The list goes on and on and below are a few more examples of dishes you should absolutely try. Lahmacun is a thin crust with a minced meat, ground peppers, and herbs with lemon juice topping. It takes less than a minute to cook in a brick oven and comes out piping hot. Hamsi, Black Sea anchovies which are slightly flour-dusted, fried and served with parsley and lemon. Super cheap and by the waterfront. I hope you have a better sense of what and where to eat in Istanbul. Check Out my post on Dubai’s Dining Scene and Where to Eat.